In the past, you probably had a shower or bathtub with a shower curtain in your bathroom. Then, you upgraded to a framed shower screen (a shower glass door with thin metal framing on all four sides). Later you thought: A frameless shower screen would certainly enhance the look of my bathroom. How about it? Shower screens have come a long way. 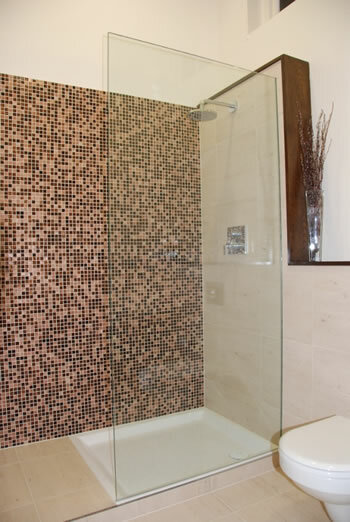 So if you want a sleek modern look to your bathroom, get a frameless shower screen. Modern Looking – Let’s be honest, frameless shower screens look outstanding. You will find frameless shower screens in many 5 star hotels and brand new luxury appartments. Clear glass panels will make your bathroom look spacious and beautiful. Thicker Glass – Frameless shower screens use thicker glass as it does not have the structural benefit of metal framing. Glass is usually about 10mm thick. Heavy – A 50 inch wide x 78 inch high frameless fixed panel may weigh as much as 150 pounds. Framed shower screens are usually light as the glass is not as thick. Expensive – If you do your research, you will find that frameless glass shower screens are much more expensive than framed shower screens. Superior Shower Doors is an experienced Atlanta frameless shower screen installer who can get you a great price on the glass. Easier to Clean – Solid sheet of glass which has no framing makes it easier and quicker to clean. Difficult to Install – Due to the heavy weight the toughened safety glass, care must be taken to ensure that it is securely installed. You are best to leave it to a professional. Left or Right Opening? – Most frameless shower screens are reversible so you can have left or right openings, unless otherwise stated. Check the specifications to make sure or consult a professional shower door installer. For more details about Atlanta frameless shower screens, contact Robert @ (678) 873-6396.